The concept behind the ancient, well-known paper folding art known as origami can also be applied to an organism’s development process – as an egg turns into an embryo, and later a mature, fully-formed being, the body wrinkles, stretches, and folds, just like a piece of origami art. We’ve seen 3D printing and origami combined before in scientific research projects to create self-folding objects, and a team of bioengineers from UC San Francisco (UCSF) recently demonstrated that many of the folded, complex shapes that make up internal tissue structures and the bodies of mammals are able to be re-created with simple instructions. 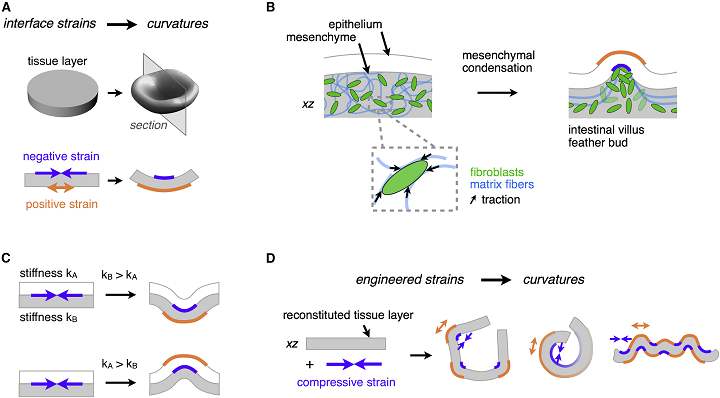 The research team discovered that mesenchymal cells actually help fold some tissue during the development process by pulling on a network of extracellular matrix (ECM) fibers, which cells secrete naturally to surround themselves with structural support. When the specialized mesenchymal cells in different parts of a human tissue pull in tandem on the network of ECM fibers, they create forces inside the tissue that bend and fold into different shapes, some of which you may recognize – villi, which resemble fingers and line the human gut, and the buds which form animal hair and feathers. The researchers were able to re-create this folding in laboratory tissue samples by applying the same natural development processes: the researchers laid down certain patterns of mesenchymal cells from humans and mice, which caused the living tissue to fold itself into various shapes, like ripples, coils, bowls, and even cubes, which are not normally seen in nature. While many laboratories working with tissue engineering create 3D shapes through the use of micro-molding and 3D printing technologies, many of these shapes don’t include, as UCSF puts it, “key structural features of tissues” which grow in normal developmental processes. The UCSF bioengineers got around this by using DNA-programmed assembly of cells (DPAC), a 3D cell-patterning technology that can fabricate the initial tissue template that folds itself up.